Warm and fuzzy, like your favourite duvet. In all seriousness, we’re very flattered and proud, particularly considering some of the other sites up for the award are far bigger operations than our own. We’d like to take a moment to say thanks to those who nominated us. So, thanks. 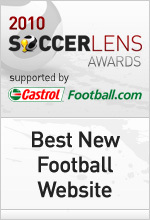 2) What kind of year has 2010 been for FourFourTwo.com? In a word, busy. We have a staff of just three hardy souls, which seems to surprise some people – that said we’ve been lucky to have the help of some very keen, very willing and certainly very able young writers, who have gone above and beyond the call of duty, really. Then of course there’s our global network of bloggers, who have consistently produced brilliant articles all year. Obviously the World Cup was an exceptionally hectic period for us, with an email newsletter going out each morning and live blogs for every match, but watching football isn’t exactly a hardship, is it? We’re very lucky to have the name FourFourTwo behind us – it’s a name people know and trust having been established over 16 years. The fact we don’t tend to chase traffic with really spurious transfer rumours probably goes a long way to develop that trust. Then, as we previously mentioned, we’ve been fortunate to have a group of mainly student journalists chipping in – writing news stories, helping with our Champions League live blogs and generally just being very lovely and useful. Without wanting to speak for my colleagues, I’d probably say the Guardian. They’ve got some great writers – Jonathan Wilson, Barney Ronay, David Conn and now Michael Cox to name just four – and as a site they generally strike the right balance between in-depth analysis and humour. 5) What’s next for FourFourTwo.com? More analysis, more live events and even more fun. And a revolutionary switch to cricket. Not really.